Happy Holidays to all my art friends. I want to wish all of you a Merry Christmas and Happy New Year. Meanwhile I would like to announce one of my new adventures in 2016: I will teach a plein air workshop in Provence, France on April 29 to May 6. Please check my Provence Workshop webpage for information and signing up. We will stay in a beautiful mansion near the Roman Arena in Arles and paint there and around the area. There is video on the page showing you some of the places we will visit. This is my first workshop in Europe, and looking forward to meeting new friends, and re-uniting with old friends in such a wonderful place. Je vous remercie. The last demo I did on the workshop is different. I told the class that they would set up the still life for me, and I would take the challenge to paint the setup. Suddenly, my shadow box has piled up all kinds of things. I was so overwhelmed. This is what I have. The reason I am doing this is that I will automatically go out of my comfort zone, and also hope I may step onto something new that I can develop in the future for my personal growth. The third demo is about flowers. You know sometime when I paint, I have this odd feeling. We use all of those pretty bad stuff, such as cadmium and lead, to create those sweet and charming illusions like apples and roses. Is that symbolic? It so weird. This is my second demo at Ada. It is rather mechanical and engineering looking. That was my intention as a matter of fact. On my workshops, we use more left brain. I establish quite a few very rigid rules. I think artists do have left brains. Why not using it? a good art should show balance. Left Dallas, I drove another 3 hours and arrived at Ada, Oklahoma. Yesterday I have started my last workshop of the year (No. 22) at the East Central University. Thanks to all artist friends for coming. It was so wonderful meeting new friends and re-uniting with old friends. This is my first demonstration. I guess I should feel OK now if a painting has achieved good quality, even my composition and style is predictable. I believe my art will be getting better for sure if I keep on going. "Demo in Dallas 2015 3"
I want to thank all the friends who commented on my yesterday's post. You encourage me to keep on going on my art journey. Today's painting is my third demo on my Dallas workshop. I challenged myself by putting quite a few unfamiliar objects on the setup. With limited time to plan and paint this one, the final painting is not what I expected. Anyway it was a good try, and the students have enjoyed seeing me go through the process in front of their eyes. This is my second demo. It is a rather good one. The roses are beautiful and the metals are vivid. However, I don't really feel satisfied with what I am doing nowadays. I saw so many artists, even some good ones, who keep on painting the same thing, again and again. You hardly can distinguish what have been done ten years ago to the work of yesterday. I keep telling myself, I don't want to be that kind of artist. I want to grow and progress noticeably. Well now, I am really humbled, because I find myself is exactly that kind. Why don't I paint some other flowers rather than roses, or use some new compositions? I don't have a good answer to this question. I must admit my limitations. I don't want complain about life, about distractions, and giving excuses. The only thing I can do is keep trying. "Demo in Dallas 2015 1"
I am on the road again. This time is in Dallas, not too far from home. I want to thank Associated Creative Artists for organizing this workshop and thanks to all the Texas and Oklahoma artists for attending. This is my first demo. Sorry the photo is not that good. I have been composing a piece of visual music on this canvas. So I name this painting "Spatial Melody". You might be curious what are those tinker thingies and why they are hanging there. I did not arrange this set of still lives myself. I painted this from a photo I took in September when I visited a cloisonné factory in Beijing. The workers hang their parts on the the wall semi randomly. They form beautiful patterns naturally without too much human intentions. I snapped a few images and know I will paint them some day. To be honest with you, I am not a very creative person. I tend to "discover" things rather than "inventing". In other words, I consider the world is all ready perfect. There is no need to create "better" stuff. We only need to do is to remove our ignorance and see better. I plan to send this piece to 2016 OPA. Please wish me luck.
" A Rainy Day in Chicago"
I feel happy about what I did today. I have been doing research on monochromatic painting for a while. The advantage of monochrome is automatic color harmony. I don't need to worry that color gets muddy. So I can concentrate on value design and texture design. You have seen a small version of this painting earlier. This one is 18" x 24". How to market my large paintings is a good question. I did show my large work in galleries, even very good galleries. However, the result was not very good. So I kind of giving up on selling my large paintings at this moment. If you are interested in collecting my large paintings, please send me an email. We can work out a deal. Happy Thanksgiving to all of you. Recall all the milestones on my journey, I am extremely humbled and in gratitude to all the support I received. 2015 has close to its end. I am very fortunate that my art is still growing. In summary we I have done this year, I made my painting calendar for the year 2016. Now it is available for you. The price is $10. If you order 5 or more, you will get free shipping. You may preview the painting images and purchase on my calendar 2016 webpage. Please enjoy. “Demo at Chesapeake Bay 2015 4"
Now my workshop teaching in November has ended. I am back in Austin now. This painting was my last demo at Chesapeake. I introduced the way I do metal and glass objects. I have not painted folds in drapes for a while, so I involve it in this painting as well. Now I am home. It is the time to ponder what is the next. Soon the holiday season starts and the year will end. I ask myself: Have I progressed this year? Have my effort achieved any effects? Do I close to my goal in art yet? In front of those questions, I am humbled significantly. The third demo was floral as usual, but the unusual this time was that I turned off the artificial light and use the pure north light as the light source for the setup. So the general tone of the painting was cool and the color was harmonized to the bluish cool color. This is my second demo. I like this grey colored urn. Many years ago when I studied with David Leffel, I really like the urns and vases he painted. The subtle color changes and textures he painted really moved me. So this time when I see this urn on the prop shelf, I immediately grab it. I have arrived at Washington DC area a few days ago. My workshop at Chesapeake Fine Art Studio today. I want thank Hai-Ou Ho for organizing and all the artists for coming and painting with me. This is my first demonstration. I really enjoyed painting at this special studio using the super high quality north light. What a luxury this studio has! I usually paint my still life painting without setting up a theme for it. However this time happens to be one of the artists in the workshop used to have a tobacco business. He brought all the props for this painting. This painting hardly has any high chroma colors. The subtle grey-s (I have to type this way because the computer insisted on this word should be "treys") and rich textures are the major players. It was quite enjoyable doing this one. My flower demo happens on the second day. I have not used this composition often. I used to put flowers on the table or paint flowers only without the vase. This composition is so typical for a floral painting. That maybe the reason I try to avoid it. However, I kind of like it after I did this one. This is my first time come to the state of Arkansas. This workshop was organized by Fort Smith Regional Art Museum. I want to thank all the artists from all over for attending and painting with me. This is my first demo. The little red dots on the table are pomegranate seeds. 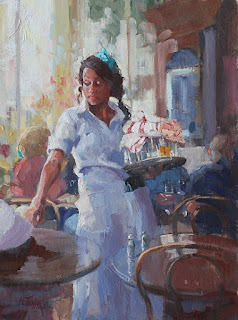 Nancy Tankersley is a great figurative painter and a wonderful teacher. Earlier this year, she taught a painting workshop here in Austin TX. All the workshop attending artists were very happy and learned a lot. We are so happy to invite Nancy back to teach another 4-day workshop: "Keeping it Fresh - Painting Figures from Photos" from March 29 to April 1, 2016. Through lecture and painting exercises, Nancy will help the students to select photographs that will make great paintings. She will demonstrate her methods of working with photos to produce a painting that looks as though it were painted from life. This workshop is suitable for all levels. Please visit: Nancy's workshop webpage to get more information and sign up. I am looking forward to seeing you and learning from the great artist and teacher Nancy Tankersley. This is another monochrome color study. My palette was the same I used yesterday. I used the ref photo I took in Chicago earlier of the year. I feel the color scheme is suitable to describe the rainy cityscape. With the monochrome approach, I eliminate the local colors. However, it still has color temperature variation. In this painting, black is my warm color and turquoise blue is my cool. With this mono approach I can effectively control muddy colors and keep the entire painting harmonized. I am considering of doing a few large paintings with this approach. This is a color study to explore the potential of monochromatic oil painting. I used a ref photo I took at Guilin three years ago. You have seen I tested monochrome scheme when I painted a few Xidi doorways. With that project I developed my warm palette. Now this one is my test of a cool palette. I used only three colors: black, white, and Prussian blue. Monochrome is an abstract color scheme, because reality is always in color. However, monochrome images can have its own aesthetics. I think my today's palette will be suitable to water related landscapes. Came back from New England, I have only about ten days at home before I travel again for my next teaching trip. How to use my broken time to do some significant painting is always a challenge. You might have remembered this painting. I started in May, but didn't have enough time to finish it. Fortunately I paint this one from a ref photo I took from Wuzhen (a water village near Shanghai, China.) So I can continue painting it when I get time. I spent about 3 more days adjusting the color harmony and adding details. I tried to apply some of the knife technique I developed when I painted my Xidi series, but it did not work well enough. Anyway, that is what I got today. Today I went with a group Austin artists to Cedar Park Water Garden. I did this plein air sketch. It was a overwhelmingly busy places, full of miniature ponds, fountains, flower pots, and other decorative stuff. I really don't know what to paint. So I found a shaded spot, observing the direction of the sun moves to estimate the light stability. Then I saw the scene. So if you feel hard to decide where and what to paint in a plein air situation, first make yourself comfortable. Secondly, you observe from your location. Am I too abstract? If you feel I am going too far, please warn me. The last day of the workshop I painted something new - the egg shells. They are not that hard than I thought. I am glad my painting ability has extended slightly. I am so happy that I will go back to the Washington DC area. On November 12 - 15, I will teach a 4 day still life painting workshop at the Chesapeake Fine Art Studio near Stevensville Maryland. Please check the workshop description. Many years experiences in optical engineering and still life painting make me confident to say that this studio has the ideal lighting condition for painters. The huge north facing window brings massive amount of stable and cool natural light indoors. The natural north light has the highest color rendering index to surpass any artificial lights. No wonder so many master level artists come to Chesapeake Studio to teach, such as Scott Christensen, Kevin Macpherson, and Scott Burdick to name a few. I am so excited to go to this wonderful place also to share my techniques. If you are interested in learning under the ideal lighting condition, the opportunity is rare, but at this moment, we do have a few openings. Please sign up by visiting Chesapeake Fine Art Studio website or contact the workshop organizer Hai-Ou Hou. The time is limited. Please decide quickly. Thanks. This is my flower demo for the workshop. I really enjoyed the color stage when I painted this one. The vase at back I used almost pure ultramarine. The apple in the back I painted really abstractly. The roses, what should I say. If you manage the light shadow relationship, they will be beautiful. I used this demo to show how I paint metals. The most enjoyable part was painting the handle of brass pot. "Demo at Landgrove 2015 1"
I have arrived at Landgrove VT, and saw my first snow of the year. This is a very small town in the rural Vermont, but the Landgrove Inn conducts quite many art workshops. This is my second time teaching here. I want to thank Thomas Checcia for organizing and thank all the artists for attending. This morning I was jogging and found an apple tree full of small apples, I thought about the demo I would do. So I collected some of the fruits, and now they are showing here. The third demo involves flowers. The workshop went very well. Everybody was happy. Tomorrow I am on my way to Vermont. Another workshop starts in a couple of days. During this workshop I stay with my friend Victoria and Doug. They have a few apple trees bringing them ton of fruit. So I used two of the apples for my demo. At this beautiful fall foliage time, I have arrived at Wethersfield CT. I want to thank Wethersfield Academy of Art for organizing and thank all the New England artists for coming and painting with me. This is my first demo. Those pumpkins really makes the color of the season. This is another large painting I did based on a reference photo I took at the Xidi village. I have extended my paintings from doorways to buildings, and from monochrome to color. I am really concerned that the painting will get muddy easily when I shift from mono to color. I have paid serious attention to the color harmony. Also I have realized that I may not want to paint this kind of archaic painting too large. I don't know exactly why. Some how I feel the history is too heavy on me. I feel pressured when I look at the aging texture of the ancient structures. I might have run into something in my previous life. Who knows. I want to pause my Xidi series now. A new phase of my art starts soon. I will travel again and keep busy. This is my fourth Xidi doorway painting. The difference between this one and the previous ones is the size. This one is a 18" x 24", while my first one was a 6" x 8". I hope you don't see too much difference from the photo images. It is easier to show painterly effect with small paintings. That is why I did this exercise. I want to make sure I can maintain the painterly look with my large paintings. I want to practice this style a little more to stabilize the approach. So I don't need too much warmup time in the future if I want to painting this kind of monochromatic works. You have seen three of my Xidi paintings, but what is this place called "Xidi". Xidi means "west post" in Chinese. It is a very old village in Anhui province. It was listed as one of the World Heritage Sites by UNESCO in 2000. Most of the houses were build in Ming and Qing dynasties, about two to four hundred years old. Following are a few of photos I took there. Our painting group stayed at Xidi for three nights. I felt I was back to the history. The last photo was our group photo there. I would love to go back to this place again in the future. Continuing on my Xidi doorway series, I did this one. The painting is slightly large (9" x 12"). I would not to say this monochromatic, because I did start to consider color now. I don't know how far I can go with this approach, but I really enjoyed what I am doing. The Chinese character above the doorway means good fortune. I hope this relatively new style of painting can expand my ability in art and eventually can bring me good fortune as well. Following the momentum of my monochromatic practice, I did another doorway painting. The simplification of the color portion of the painting allows me to concentrate on the texture manipulation. Aesthetically, the monochromatic harmony and the roughness of the texture gives the artwork a sense of time transition, a feeling of old age. Beauty seems closely related to old and imperfectness. That is why we collect antiques, and visit old places. I don't know why, but this is my intuitive thinking. If you have a more philosophical explanation, please educate me. I am very curious about this topic. Due to the jet lag, I got up really early. I started painting this one at 5:00 AM. This is a good exercise of monochromatic painting. This approach is suitable of presenting old architectural structures. During our China painting trip, we spent quite a few days in an old village called Xidi. Most of the buildings there are more than two hundred years old. This place is the paradise for me. I have seen so many paintings I want to paint. I was so excited the first night I couldn't sleep. I am sure I will go back to this beautiful place and paint more plein air. Now I am painting from the photos I took. For this painting I used only three colors: black, white, and transparent oxide red. It is almost done completely with palette knifes. I have come back to the States last night. When I was in China, the internet assessment was not great so I wasn't up to date what I was doing. But it was a superb trip. I did 8 paintings and took a ton of photos. After I process my photos I will share some of the high lights with you. I did this painting as a plein air demo at Hangzhou by the Xi-hu (West lake). It was a beautiful garden. It was quiet place and the weather was ideal. As a matter of fact, it was my first time of painting lotus. It was a wonderful experience for me. Quite a few artists in our group painted along with me. They did wonderful job as well. I painted this window as the demo for my group. We have wonderful time. I saw so much, but I am too exhausted to writing any more. I am going to bed. zzzzzz. We are on the Yellow Mountain. One picture worth more than ten thousand words. This is my demo at Summer Palace. It was a wonderful day. We painted at this lovely garden. It was very crowded. So many people surrounded us. I think we have inspired many local people and tourists. You never know. Maybe because this plein air event, some people will become future artists. That is my mission. I hope we will enjoy the beautiful world more this way. We have ten artist in our "Painting in China" group. We have had great days in Beijing. Now we are in Xi-an, and will go to Huang-shan (the Yellow Mountain) this afternoon. I did this painting from a photo I took at the Beihai Park in Beijing. I gradually gained more momentum in painting. I started to see the grey colors in Beijing. There are more than 50 shades. I use this small floral painting as my warmup here in Beijing. I copied a part from one of Richard Schmid's paintings. I must admit that it was a struggle. I felt so many forces around me trying to stop me from painting. All of those forces are strong, full of charge and seem reasonable and legitimate. I felt I am fighting against my fate. This painting was not one of my best shots, but it is more significant because it is a proof that I am still moving forward. In front of my fate, I may lose eventually, but I will try all my might to go as far as I can. I arrived at Beijing in the rain. This morning I walked on the street, everything is crispy clean. This erases my concern about the air quality in this giant city. I hope it can keep this way during our painting trip. My mother is doing greatly. She is in good health and practicing her recently accepted Catholic faith, which gives her peace in mind. I have pulled out my colors and set up my easel in my tiny bedroom. I will start painting very soon. I have adapted this super unstable life style. Time, locations, culture, and languages are so illusive. I feel I am living in a big dream. I must admit that this year is a more difficult in my art career. Being an artist, it needs not only talent, inspiration, and creativity, but also courage, patience, and tenacity. The latter is a way more important.